I have a love/hate relationship with dry shampoo. I love how it extends my style but I hate trying to rid my hair of the white residue it leaves behind. 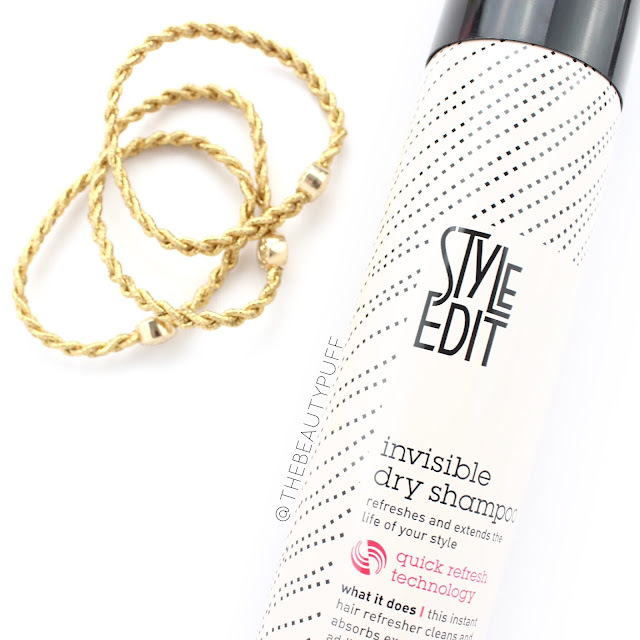 Style Edit's dry shampoo is different from all others that I've tried because it is completely clear! That's right - no color, no residue, nothing. It's a brunette's dream come true. For those not familiar, Style Edit is a salon brand that can either be found at your local salon by searching here or you can purchase it online. Style Edit also makes root touch-up products to extend your color. Today we'll be focusing on the dry shampoo. As with any dry shampoo, this formula helps absorb excess oil to extend your style between washes. What makes it unique is that it deposits absolutely no color onto your hair. There's no white, powdery residue that needs to be worked into hair after spraying. This makes it easier if you just want to add a bit of volume without disturbing your style too much. Also, for those of us with dark hair, there's no worry about missing a spot and having lighter areas left on your hair. I don't want to appear like I'm going gray just yet, thank you very much! Not only is this dry shampoo invisible, it also feels weightless on my hair. If a dry shampoo is too heavy and leaves residue behind, my hair feels dirtier than before I applied it. Not exactly the point of dry shampoo is it? The Style Edit formula features invisible micro-powder so you get the benefit of invisible, weightless volume that makes your hair feel light and airy. This is a great product to have with you on long-weekend trips or vacations this spring and summer. Less time washing your hair means more time to enjoy all those outdoor activities! If you love time-saving products in your beauty routine, check out the Style Edit Dry Shampoo and more Style Edit products below!